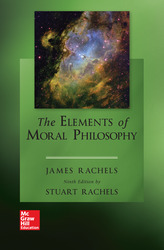 The Elements of Moral Philosophy 9e by James Rachels and Stuart Rachels is a best-selling text for undergraduate courses in ethics. Thirteen thought-provoking chapters introduce readers to major moral concepts and theories in philosophy through clear, understandable explanations and compelling discussions. Chapters are written so that they may be read independently of one another thus providing greater flexibility for students and instructors. Chapter 1: WHAT IS MORALITY? Chapter 4:	DOES MORALITY DEPEND ON RELIGION? Chapter 9:	ARE THERE ABSOLUTE MORAL RULES? Chapter 13:	WHAT WOULD A SATISFACTORY MORAL THEORY BE LIKE?